The Wisconsin Committee for Employer Support of the Guard and Reserve (ESGR), an agency of the U.S. Department of Defense, honored Linetec’s paint operations manager Paul Bratz with a Patriot Award. Sgt. Bradley Pochinski nominated Bratz for “extraordinary support” of employees who participate in military service. Pochinski serves in the Wisconsin Army National Guard assigned to the A Company 1-128th Infantry Regiment, 32nd lnfantry Brigade Combat Team, based in Menominee, Wisconsin. 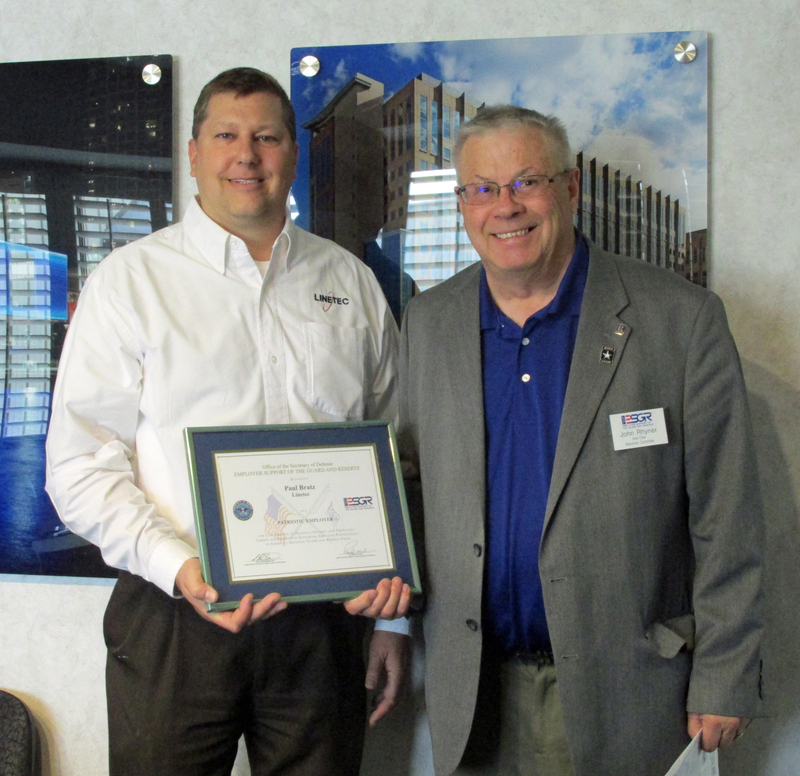 On April 22, John Rhyner, area chairman of the Wisconsin Committee for ESGR, presented the Patriot Award to Bratz at Linetec’s facility in Wausau, Wisconsin. “It is a true honor to be nominated by Bradley. We are so proud of him and grateful for the many who serve our nation through their military service,” said Bratz. The U.S. National Guard and Reserve currently includes 1.3 million members. As of March 2015, the number of Guard and Reserve component personnel on active duty totaled 23,871. The ESGR accepts Patriot Award nominations from all members of the National Guard and Reserve. Located in Wisconsin, Linetec serves customers across the country, finishing such products as aluminum windows, wall systems, doors, hardware and other architectural metal components, as well as automotive, marine and manufactured consumer goods. The company is a subsidiary of Apogee Enterprises, Inc. (NASDAQ: APOG). Linetec is a member of the American Institute of Architects (AIA), the American Architectural Manufacturers Association (AAMA) and the U.S. Green Building Council (USGBC).